As I mentioned on the Events board, I am nominating Marie's Pizza for a GNR. Husband and I lived in Andersonville for 8 years and enjoyed many of the restaurants and bars within walking distance of our apartment at Foster & Glenwood. When our building went condo, we decided to house-hunt and wound up buying our home in North Mayfair. We had never heard of Marie's, but wound up there our first night in our new home, exhausted from the move. What a treat! The atmosphere is dated/retro, but I immediately found it comforting and remnicent of childhood pizza/Itailian places my parents took me to growing up in Wisconsin. There is just something cool about a place that's been there forever and never feels the need to change - kind of like Burt's Place ( although Marie's has been in the same location longer.) The atmosphere is usually lively and fun, (especially on weekends and live entertainment nights,) but it's really the pizza that keeps us coming back. The thin crust is done right, there's not too much cheese, the sauce is just right for the style of the pizza. Service is familial, the bartender knows the regulars and if you come in every once-in-awhile he'll know you too, and the Chicago game is always on TV. Marie's may not have the best pizza in town, but it's certainly the greatest neighborhood restaurant in my 'hood and I don't think those who love thin crust pizza would be disappointed coming from any neighborhood. I happily second this nomination. As I have posted elsewhere, I've been going to Marie's on and off since the 50's, and even then Marie's was already at least 10 years old. I dissagree with LynnB in one regard. 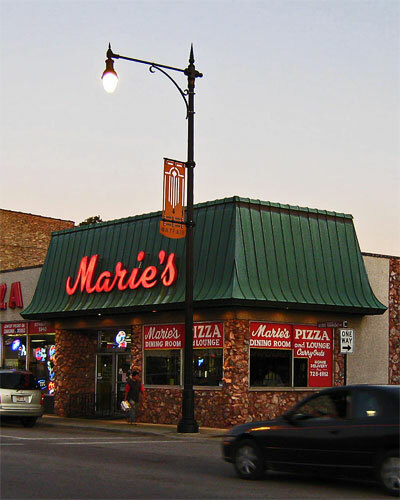 I would put Marie's among the two best thin crust pizzas in Chicago (the other being Vito & Nick's). Marie's is that perfect combination of 50's style neighborhood bar and family restaurant...plus, the fact that there is a liquor store attached is a real plus! I am solidly behind this nomination, as well. I love Marie's and have been known to make a dedicated trip there from Deerfield, especially when I know in advance that traffic is light. Their distinctive, thin-crust pizza is highly addictive and their convenient location -- just minutes off the Edens -- makes the trip a relatively easy one, even from Lake County. I find myself craving this pizza at times -- so much so that my mood lifted when the recent construction on the Edens ended, because that meant that Marie's was very much back within my reach. I must say, Marie's is one of the few places with a solid LTH reputation that I simply don't get. Standouts in my mind at Marie's include rusting iceberg lettuce and the travesty-of-all-travesties: canned mushrooms. No place willing to serve that horrible imitation of food deserves this honor, imo. Luckily, the GNR list includes so many outstanding places that I'd still confidently point newcomers to it, but if this wins I'd have to add a caveat. Kennyz wrote: I must say, Marie's is one of the few places with a solid LTH reputation that I simply don't get. Standouts in my mind at Marie's include rusting iceberg lettuce and the travesty-of-all-travesties: canned mushrooms. No place willing to serve that horrible imitation of food deserves this honor, imo. Luckily, the GNR list includes so many outstanding places that I'd still confidently point newcomers to it, but if this wins I'd have to add a caveat. I really can't argue with your points, Kenny. They just don't lead me to the same conclusion. The salad is average, at best. I'm not a huge fan of canned mushrooms (which are not imitation, I might add ) on pizza, although I'm not really a fan of fresh mushrooms on pizza, either. For me, it's all about their pizza, which I absolutely adore. In fact, I like it so much, it completely makes up for the relatively insignifcant weaknesses you describe above. For me Marie's is a total package experience, not a matter of the food per se. Okay, I'm getting into one of the thornier thickets of GNR contention here. I don't crave the pizza, I get a very similar delivery pizza from D'Agostino's and it's fine, but I think Vito & Nick's for one outshines it by a healthy margin. What I love about Marie's is that in a city of trendy, grownup pizzas and an age of Chuck E. Cheese's, this is a family place in the old sense, a place where the adults can get a drink and the decor is 60s-swanky and the waitresses are no-nonsense and yet the kids are welcome too and can get their first taste of how to behave in the adult world as they sip their Roy Rogerses and watch the guy in the window throw pizzas. And then, at the holidays, a place that's already dialed up to 11 New Jersey-Italian-atmosphere-wise takes it up to about 17 by wildly overdecorating. In short, Marie's is a treasure, but the pizza-- though good for the north side-- is only a small part of the reason why. No backlash from me, differing opinions are what makes LTHForum interesting. Speaking of differing, I both agree with you and disagree, sure Marie's fried appetizer plate is frozen food service, salads are not exactly artisanal, but I've enjoyed each and every outing to Marie's over the years, delighted in taking out of town visitors over the Christmas season for the totally over the top decorations, been with groups of all sizes and configurations and even wasted a few brain cell at the convivial and reasonably priced bar. Not to mention pick-up, delivery and the occasional quiet last minute pizza date with my bride. Ok, sure, the place has a cool old school vibe, a chandelier that Liberace would covet, but what about the pizza, I am a fan of Marie's Chicago style thin crust, though truth be told it is only my third favorite in the extended geographic area, with Zaffiro's number one and Vito and Nick's second. Still, with, at last count, nine million pizza joints in the area serving thin crust having my number three pick ten minutes from my house is a treat. If I had to levy one criticism against Marie's it's that I don't consider pick-up or delivery an option. Their pizza has exactly 8 minutes and 37 seconds after leaving the oven before quality starts to decline exponentially. But those minutes are very good. But, like Mike and Gary said before me, Marie's is more than a very good, classic Chicago thin-crust. It's a unique boatload of atmosphere too. It's a special kind of throwback and I feel good that Marie's is still going strong. eatchicago wrote: If I had to levy one criticism against Marie's it's that I don't consider pick-up or delivery an option. Their pizza has exactly 8 minutes and 37 seconds after leaving the oven before quality starts to decline exponentially. But those minutes are very good. Michael, the engineer in me thanks you very much for that useful, and precise, information. I am enjoying the vision of you sitting there with a stop watch and taking a bite every second (because chewing would take too much time, I assume you had to bite, taste and spit) and identifying the exact second when the Rubicon of tastiness had been crossed. Mark that down as one more reason why I love LTHForum and mods, please note that I nominate the last two sentences of that quote for the masthead. dicksond wrote: mods, please note that I nominate the last two sentences of that quote for the masthead. We're gonna need a bigger masthead. eatchicago wrote: If I had to levy one criticism against Marie's it's that I don't consider pick-up or delivery an option. Totally agree. But in contrast to Mike G, above, I also find those 8 minutes and 37 seconds quite unlike other north side, Chicago thin-style joints. Yes, the atmosphere is part of it, but I think the pizza definitely holds its own and then some, within its genre. Piping hot, fresh from the oven pizza pies are what it's all about at Marie's. Because so many people order pizza out, it's too bad we can't give a GNR just for dine-in. The old school charm adds so much to the experience anyway, take out or order delivery at your own risk. You can put me down as a die-hard Marie's Pizza fan as well as many of my friends and most of my family. But we get PIZZA, not the rest of the menu, so order at your own risk. By the way, I found a virtual clone of Marie's in Appleton, Wisconsin last week called Frank's Pizza Palace (since 1955). If you love Marie's, get up there quick! I'm going to Green Bay on business next week, so I can have it again! They even have sausage pizzas to go in a freezer case. Marie's Pizza gets my vote. I don't know much about the menu but they make a fine anchovy pizza and that's pretty much all I need to know when it comes to a pizza place. 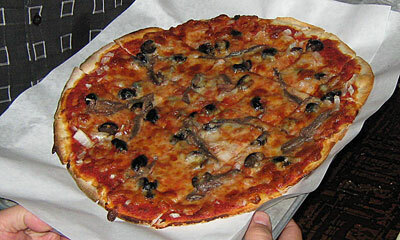 The anchovies had the right amount of saltiness and it went went well with Marie's sauce. The real beauty of Marie's is the interior. It looks like it's stuck in the 70's with red booths and wood panelling walls. The place doesn't look like it has changed or will be changing anytime soon. When I looked up Marie's on the internet I noticed it doesn't have a website but it's the type of place that shouldn't have one, it's stuck in another time and should stay that way. Its weird because I had been meaning to endorse Marie's when it first came up and forgot. As I sit here watching ESPN there is a segment on how today is the 20th anniversary of Kirk Gibson's home run to win the world series. I still remember where I was when that happened.I was at the back bar at Marie's with my uncle watching that game and was seven years old. It hasnt changed in 20 years for the better. One of my favorite Chicago pizza joints. REB, MiL, and I headed to Marie's last night to check it out. Great-looking LTH photos and seemingly strong support in this thread had our expectations fairly high. Unfortunately, after our visit, I cannot support Marie's for a GNR. As noted by others, the pizza seems to be the only quality product coming out of Marie's. We ordered a large, well-done pie with sausage, mushrooms, and green olives. In a nutshell, this was a good, but not great pizza. Crust was nice and crispy; sauce was fine, but a little bland; cheese was standard; sausage was good; olives were very good; mushrooms were canned. Everything else we ordered was meh, at best. Service was fair, but our server was clearly not very interested in us. We asked if there was a beer list. She answered, "No," and walked away. Flagging her down to follow up was more trouble than it was worth, since nobody HAD to have a beer, so we went without. The wood paneling and general old-school decor was a throwback, but so what? If there were a GoodNR award, I'd say fine. But from our perspective, there was simply nothing Great about Marie's. Thanks for joining me. It was lonely here in the "I don't get Marie's" lounge. 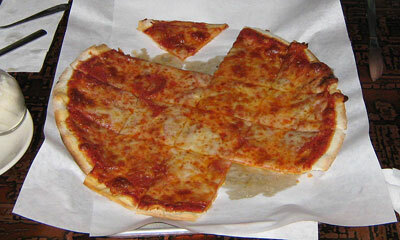 Marie's Pizza is one of the very first restaurants I sought advice on and used. It was before there was an LTHforum, I needed a good pizza recommendation near Pulaski and Peterson. It may have been Rene G who recommended it. I bought several cheese pizzas for a mushroom club meeting, then arranged wild mushrooms I had cooked on them. Super mushroom pizza, if I say so myself. While I rarely eat at Marie's, I often drive by at night. I have this silent relationship with the guys who toss the pizzas. I will pull over to watch them toss a few, give them a thumbs up, they smile and wave, then I drive on home. Based on my limited exposure, I can see why people support it for a GNR. I definitely support Marie's for renewal, had there pizza at this past years GNR dinner, and loved it, made it back a second time, and liked it just as much. Has all the things I like in a neighborhood place, comfortable vibe, great thin crust pizza, and a friendly engaging staff. I wish I lived closer. My one and only experience at Marie's was the GNR dinner. I thought the pizza was good. I thought everything else was, well, less than good. I can see the charm of the place though. A wise person once told me there are only two reasons to go to Marie's Pizza & Liquor, and they're both in the name; all the other stuff is unnecessary distraction. Any pizza at Marie's with bacon on it is really something special and not to be missed. I'm on board with a re-up, but I wonder if we should/could consider adding a caveat, much like the Shiu Wah/Dim Sum GNR. Since the experience of being at Marie's is just as important as the food here, and it's been discussed in the threads that there's a window of time where the pizza is at its peak, should it be added that the GNR is for dine-in specifically? I don't think it is the best pizza, but it is consistently good and a "cheap" date that I never pass up. I've never had a bad pizza at Marie's. I love that it comes out of the front of the house and is made at the window. I love that you have to walk through the liquor store to get inside the restaurant. I love that they plop a piano and some other musicians that perform jazz regularly in the middle of a pretty small dining room. We are regulars and enjoy the ambience, if you can call it that, very much. It is an unusual and special place, with old school charm, recognizable staff year after year, and the craziest Christmas/Holiday display I've seen outside of the house on Logan Boulevard. I go to Marie's often, but especially in December-year after year-just to see the incredible decorations AND have a good pizza. Edited to add: I love the red vinyl chairs, booths and swivel bar stools, the mirrored walls and the "stained" glass effect tables. Last edited by Food Nut on March 19th, 2010, 1:16 pm, edited 3 times in total. Food Nut wrote: I love that they plop a piano and some other musicians in the middle of a pretty small dining room who perform jazz regularly. Please note that we do not put plates on the piano. My wife and I started to order from Marie's when we moved to our current place and realized that most of our prior delivery options didn't deliver to our area. Marie's does and so it has become part of our regular delivery rotation. I understand the sentiment that their pizza is better when eaten in the restaurant, but I think that is true for most pizza (and other foods too). In any case, I really like the pizza and support this nomination. Thanks for the morning chuckle. That was a funny moment. I'm pretty ambivalent about Marie's GNR status after having been there twice in the past two years. I think the pizza is quite good, but everything else I've tried ranged from bad to barely passable. I think pizza at both Burt's and Vito & Nick's is leaps and bounds better than Marie's. I'd send out-of-town guests to the former two, but not to Marie's. If I'm in the neighborhood and hungry, sure, I'll stop for a pie. But, for me, it's not a destination. Yeah, I think it's fine, but not a destination. For me, a GNR isn't just something that's nice to have around, it has to be something worth going to that neighborhood for, and I just don't think Marie's is that. Easily my favorite thin crust on the north side. I became a Marie's convert during the last 2 years. A definite yes on renewal. The pizza here is very, very good and it is destination worthy IMO. jesteinf wrote: My one and only experience at Marie's was the GNR dinner. I thought the pizza was good. I thought everything else was, well, less than good. I can see the charm of the place though. Marie's is my go-to pizza, terrific crisp thin crust coupled with old school charm, musical entertainment ranging from jazz trios to roving musicians, hyper reasonable drink prices and a $2 corkage on wine bought at the attached liquor store. I go all though the year, but Valentines Day has become a tradition. Marie's Pizza, count me a fan!